Key companies to name in the global market for small cell power amplifier are Broadcom Corp., Texas Instruments, Skywork Solutions, NXP Semiconductors, Qorvo Inc., Anadigics Inc., and Tektelic Communication Inc. 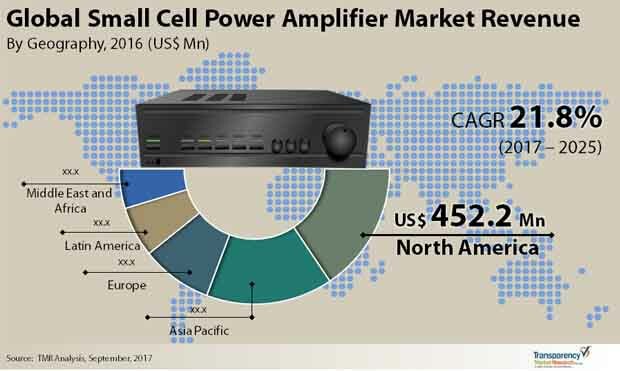 According to a new business and market intelligence publication by Transparency Market Research (TMR), the global small cell power amplifier market is predicted to rise at a phenomenal CAGR of 21.8% between 2017 and 2025. At this rate, the market will be valued at US$8.53 bn by 2025 from US$1.45 bn in 2016. In terms of gain in amplifier, 36 dB gain segment holds the leading share. The segment held the leading close to 29% of the overall market in 2016; in the years ahead too, the segment is likely to hold on to its leading position mainly because higher gain amplification enables greater data coverage capacity of small cell power amplifiers. Geography-wise, Asia Pacific is expected to expand at the leading growth rate mainly because of expansion of telecommunication services and soaring sales of consumer electronics. The global market for small cell power amplifier has been witnessing strong growth, and is predicted to continue maintaining it over the forecast period. Rising internet penetration in both urban as well as rural areas, which is bringing about data congestion is likely to stoke demand for small cell power amplifier. Small cell power amplifiers comprise small cells and owing to their small radii, they can improve rate of data coverage and data transmission rate. In addition, greater data coverage capacity, higher bandwidth, and higher gain in amplification are some other attributes of small cell power amplifier that account for their high adoption. Hence, incessant penetration of the Internet and investments for expansion of telecommunication network is acting in favor of the small cell power amplifier market. Moreover, considerable number of installation of small cell base stations owing to their simple and relatively inexpensive installation as compared to macro cells promotes demand for small cell power amplifiers. Pico cells are popular small cell type which can improve data coverage, bandwidth, and transmission rate because of which small cell base stations are significantly opted by network service providers. These factors collectively serve to boost the growth of small cell power amplifier market. Developed regions such as North America hold prominence in the small cell power amplifier market. This is mainly because of massive infrastructure for data coverage and hassle-free data transmission. On the other hand, developing countries hold substantial potential for the growth of small cell power amplifier market. With increasing spending on consumer electronics, telecommunication infrastructure in developing nations is undergoing an overhaul. The high bandwidth requirements for impeccable data transmission requires specialty components such as small cell power amplifier in the structural network. This bodes well for small cell power amplifier market. Lastly, substantial investments and research and development initiatives undertaken by large players to introduce novel products also favors the small cell power amplifier market.